This photo always gave me a weird feeling. Of course, it's possible that the alleged apparition may be a statue or something (hence why she looks kind of 'wrong') but this was one of the first photos that got me into this site (along with the weird vampire grave/photography weirdofest). Yeah, like the likelihood of a fleshy-colored figure across the "child's" lap. ....and I say "possible" due to the fact that it could be just the rocks and paredolia. ....Quite frankly; I think there is no second figure and the "child in a blue dress" is all there is. 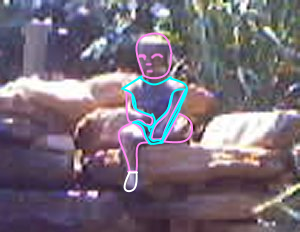 Looking more at the "kid", it seems that it may even be a bit transparent (look at the head and the foliage around it). Yeah. I think the alleged "second figure" is just thee rocks. You can see how the "child" is somewhat transparent, right? The woman who submitted this said it was a waterfall at a nature trail in Kansas but doesn't name the park. I'm going to image-search the words "kansas nature trail waterfall" and see if I can find a photo that resembles the waterfall in this photo. I want to make a comparison. Edited by SpukiKitty, 28 November 2018 - 11:36 PM. It’s obviously a man-made waterfall so I doubt it’s a “nature trail” maybe more of a botanical garden. I wish Jim had asked where this was taken. I agree that the paler figure is likely just the rocks and can definitely see the "child" sitting down. I think it looks like a statue/ornament of some sort though, although it also looks kinda transparent. The jury's out for me, unless we had a picture of the same area for comparison. @ SpukiKitty: "Vampire Grave/ photography weirdofest"? I've never heard of that before and now I'm super intrigued haha. 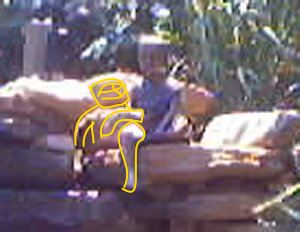 Unfortunately low resolution images create an abundance of mistaken identification. It's obviously a man-made waterfall so I doubt it's a "nature trail" maybe more of a botanical garden. I wish Jim had asked where this was taken. Yeah; It's obviously a human-made structure. I tried looking up pics with "kansas waterfall nature trail", etc. but came up with nothing that matched the photo. Since it's an artificial structure in a botanical garden or park. Perhaps I should use different terms like "kansas botanical garden waterfall". I need to find a comparison for those alleged vampire graves, too. I'll try "vampire cemetery romania transylvania". and see what pops up. I agree that it could be clearer. EDIT: Try as I could but I couldn't find a photo of this one waterfall anywhere! Edited by SpukiKitty, 29 November 2018 - 08:38 AM. I tried googling too but I didn’t have any luck. I was thinking that if it were a man made waterfall then there is a good chance it’s a statue. it might just be the quality of the photo that is giving the impression? It's easy to see though and very easy to see the kid! You see the kid as transparent too! Cool! You are quite right. The transparency comes from pixel blending produced by low resolution images with low end optics. This is a hardware limitation found frequently when zoomed in at 100%. It's naturally explained and once mixed with belief system validation, a new perception is identified falsely. Edited by EVP, 02 December 2018 - 07:25 AM.